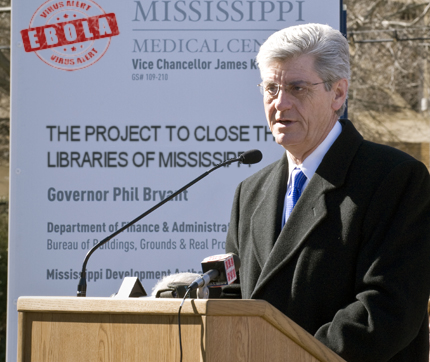 Mississippi Governor Phil Bryant has decreed that all libraries in the Magnolia state be closed and the books inside be burned in order to halt the spread of the deadly Ebola virus. In a speech yesterday, Governor Bryant made the announcement to a partially bemused and partially angry Hattiesburg crowd. He announced that the libraries will remain closed until such time that the threat of Ebola has passed and every surface in every book lending building has been thoroughly disinfected and found to be infection free. "According to the CDC there are over 2000 confirmed cases of librarians infected with the Ebola virus," Bryant told the gathered masses, "and it is our responsibility to ensure that these people do not infect the community at large. While both my colleagues and advisers, and my political opponents have condemned the seemingly draconian measures, I believe that we need to act swiftly and strongly to guarantee the safety of the people of Mississippi." 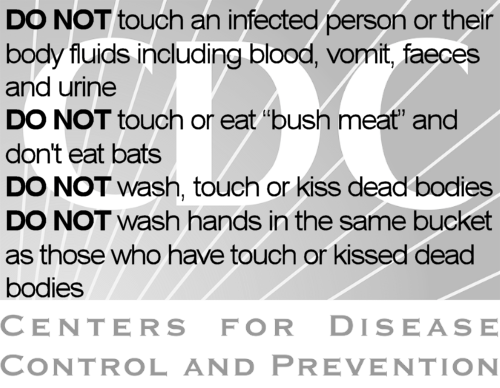 Governor Bryant also reiterated the CDC's golden rules to prevent catching Ebola from those infected with the disease. So far the number of laboratory confirmed cases of Ebola in the US is 4, with only one of those proving fatal. I trust that the efforts in Mississippi will stop these numbers from rising any further. That's probably the dumbest way to contain an outbreak I've ever heard of. Well done Mississippi, living up to your rep yet again.